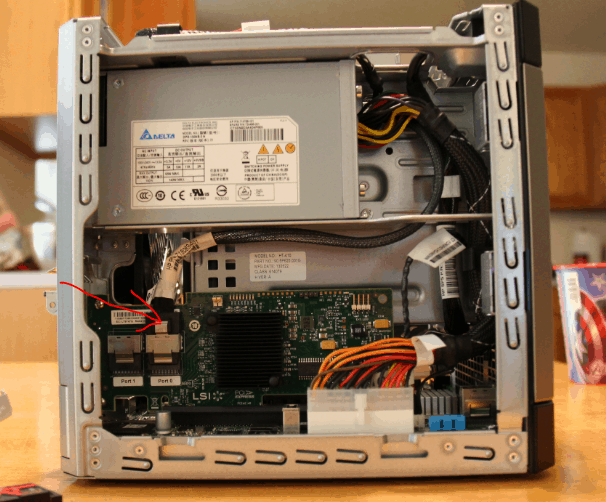 Here’s a quick overview on installing the IBM ServerRaid M1015 HBA (aka LSI SAS9220-8i) in the HP Gen8 Microserver. These cards can be bought for around $100 on ebay. The HBA has two 6Gbps SAS ports (each port has 4 lanes, each lane is 6Gbps giving a theoretical maximum of 24Gbps per port and 48Gbps if using both ports). A typical configuration for maximum performance is one lane to each drive using a SFF-8087 breakout cable. With two of these cables this card is capable of running 8 drives. You can run more drives with a SAS expander but I haven’t had a need to yet. I typically flash it into IT (JBOD) mode. This is a popular card for running ZFS, which is my use-case. The picture above shows the original location of the 4-drive bay SAS connector, you just need to move it to the HBA, I didn’t have to re-wire it, there is plenty of slack in the cable so I just had to pull it to the M1015 and plug it in (below). At first boot all my drives were recognized and VMWare and all the guests booted up as normal. 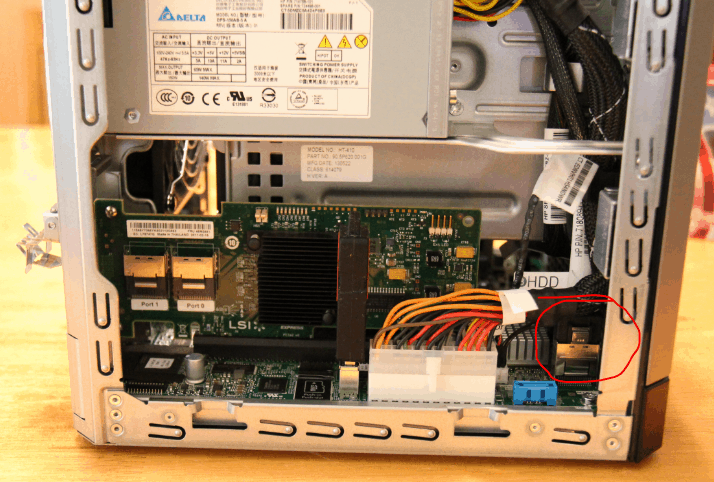 Also, a few people have asked about mounting an extra drive in the ODD bay, here’s the power connection I think could be tapped into with a Y-splitter (below). Does this have an advantage over the Gen8 Microserver’s B20i SmartArray controller? For a lot of setups it probably offers no advantage. I probably wouldn’t do it in my environment except I already have a couple of M1015’s lying around. Here’s what you get with the M1015. In IT mode drives are hot-swappable. No need to power-down to swap out a bad drive. B20i only has 2 6Gbps ports, the other two are 3Gbps. The M1015 can run up to 8 lanes (10 if you use the first two lanes from the B20i) in 6Gbps. If you’re using the server as a NAS you’re more limited by the two single Gbps NICs so this shouldn’t be an issue for most setups. 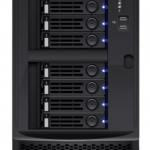 The M1015 is known to work with 4TB drives, the Microserver only supports up to 3TB. VMWare can be booted off a USB, but it needs at least one SATA drive to store the first VM’s configuration, so whatever SATA controller that drive is on can’t be used as a pass-through device. So if you want to pass an HBA directly to a VM (which is a typical for Napp-it All-in-One setups) you can pass the entire M1015 controller to a VM which gives it direct hardware access to the drives (requires a CPU with VT-d). Are you getting any issues with passthrough? 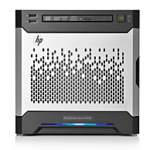 It seems that folks are experiencing issues when passing the M1015 through on the new HP gen8 Microserver. Hi, interesting issue… I am using the M1015 in IT mode but I have not actually tried passthrough on the Gen8 HP Microserver. Before I got the Microserver I did compare performance of OmniOS on ZFS with passthrough and without on a Supermicro board with the Xeon E3 and didn’t see any performance difference so I just decided to run on VMDKs. I too come from supermicro/asus IPMI land, where remote KVM comes with the hardware. But I’m new to the iLO4 world. I’m wondering if I’d be required one to purchase and install a separate iLO essentials or advanced license in order to get a similar screencapture to yours above? Or is what you show a stock gen8 microserver iLO session, with no additional licenses? Nice to know that this card works, it really isn’t that expensive. I just bought the server and have two NL-SAS (Near Line SAS) 3TB harddrives. The issue that I am experiencing is that of course the B120i does not recognize the drives, but also the drives don’t even spin up (I hear it, I feel it, I tare it out and no spindown sound or feel either). The drives are OK, the bay is OK since other SATA HDDs work. I know that B120i will probably not be able to use NL-SAS drives, as it can’t use SAS drives. 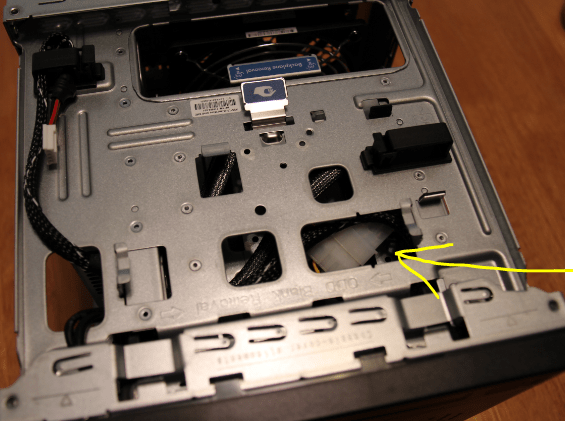 but I also see that the bay has a SAS connector and not just SATA, that is why I was able to stick in the NL-SAS drives. Do you think that getting a M1015 will also solve the spinup problem if all I do is put the mini-SAS connector on the new card rather than the one on the motherboard? Can it be that the M1015 gives some extra ammo to the same connector to spinup NL-SAS drives? Hi, Daniel. I believe the M1015 is a SAS/SATA controller so I think it will drive SAS drives but I’ve never tried it myself and I don’t own any to give it a test. Those M1015’s are awesome. Glad it worked for you. Just so I’ve got this right, you were able to run NL-SAS drives in the Gen8 with another controller? so the M1015 does have a SAS backplane, so if i was to get another controller I could run SAS drives in it? Exactly. I just put in the M1015, connected the miniSAS cable from the mainboard to the M1015 and then the inserted SAS drives powered up (through the normal backplane) and became usable. Also with the M1015 I got four 6 Gbps ports. So the normal backplane is absolutely capable of using SAS, NL-SAS drives also. Without the M1015, the inserted NL-SAS drives didn’t even power up, so somekind of power wasn’t running through the same miniSAS cable when connected to the mainboard. Thanks for the confirmation! I have a P420 with 2GB cache module and 6 2T NL-SAS drives and was trying to figure out what platform to get because the MS G8 only says SATA on the quickspecs. 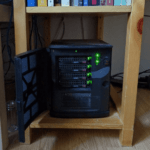 My other thought was a ML330G6 because it can go to 8 LFF, but now I’m thinking of going with the MicroServer and either cramming the extra drives in there or transplanting it into a slightly bigger case somehow. I plan to use the other 2 ports for SSDs with the SmartCache feature. 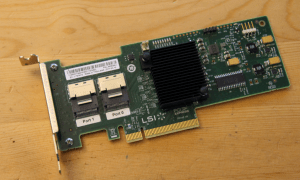 While I admit it costs more, the HP SmartArray P222 (HP documented compatible) and HP SmartArray P420 RAID controllers integrate tightly with the iLO4 of the MicroServer Gen8. This means the iLO knows if a drive in your RAID array has failed, and you can be alerted via e-mail to the status of your array. Also, for the lesser price of the IBM controller, you can find the earlier HP SmartArray P212 or P410 on eBay. These both offer hardware RAID-5 and full caching (256MB/512MB/1GB) either battery-backed or flash-backed. HP has had excellent support for these two controllers, both drivers and firmware-wise. You won’t get the iLO integration at this point, but it works great and you can still use the B120i controller on the mainboard simultaneously. Has anyone had any success using a HP Microserver Gen8, with the HP P222 in PCI-Passthrough mode?, I’m currently running a G8, with a P222, and a Xeon E1230v2. I’m having massive issues getting it to work, I’ve configured an array, and copied quite a sizable amount of data to it, and want to run it as a ‘virtual NAS’ and use 2x SSD’s on B120i in RAID1 with ESXi running off SD. However, it appears that its either not working due to ‘issues’ some people mention to do with Ivy Bridge based CPU’s or due to the P222 not being ACS capable (device not being able to passed through, due to on switched/shared PCI bus). I’ve had a P410 in the system, but couldnt get passthrough to work on that either, and also had a disk failure, and because of ILO4 not understanding HP P410’s (no idea why not!) yet, I didnt know about my raid failure (degraded) until about a week later, thus the hurried purchase of the HP Smart Array P222 card.. .
On a slightly related note, does anyone running a P222 receive a Critical temperature alert on the P222 in the ILO4 due to the temperature of PCI1 going to 103C (it auto-recovers and settles at 90~C after about 30 seconds). The Smart Array family doesn’t support pass through or HBA mode. Heard rumors the P430 and other x3x controllers might, but not confirmed yet. The workaround is to get a cache module and then configure each drive as a RAID0 array and logical drive. You need the cache module because otherwise three controller limits you to 2 Logical Volumes. Is it possible to use a SATA hard disk contains data on the B120i without loss the data? Any fan isssue when using an IBM HBA ? i.e. what it the fan level ? If i use the IT mode and zfs, can it resolve the noise problem like this? If having the IBM ServerRaid card allows you to put the built in RAID controller into RAID mode it may help a small amount. 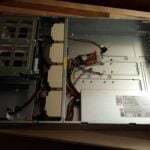 Stefan reported here https://b3n.org/installed-xeon-e3-1230v2-in-gen8-hp-microserver/#comments that putting the RAID controller in RAID mode brought the fan speeds down. But I tried it both ways and didn’t notice a difference. I got a LSI 9260-8i from a friend at work, would this work in my microserver (Gen8)? 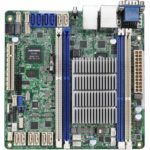 I bought a ms gen8 running with ESXI6.0U1 and now want to purchase a raid card(m1015 OR m5015,P222 is quite expensive).But I have some concerns. Can I configure m1015 or m5015 settings via iLo remote console?Can it use for booting OS without using hp b120i? Hi, niclau, I was able to access the M1015 settings from iLO, you’ll be presented with an option to go into the card setup during boot (unless the card is in quiet mode, but then you can reflash it). I should note I was never able to pass the M1015 via VT-d to a guest VM on the Gen8 Microserver. 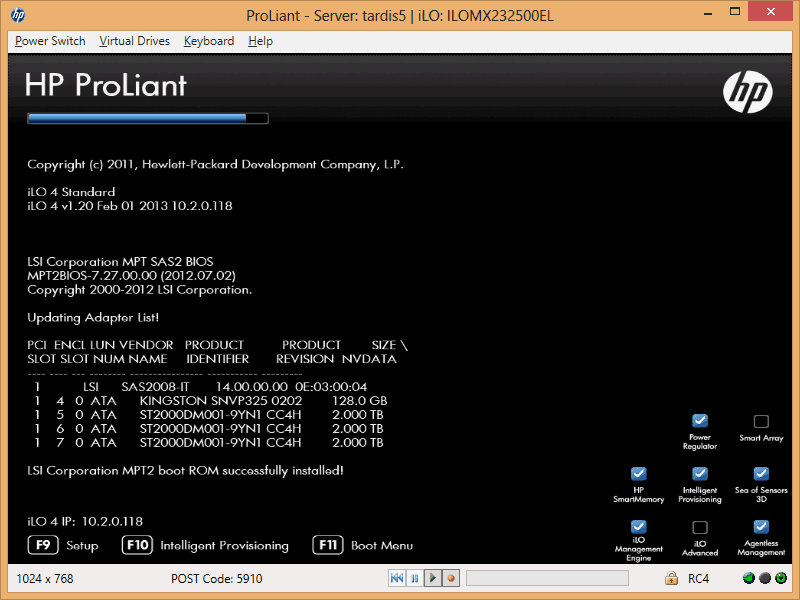 I never tried booting off of a drive on the M1015, I booted from a USB stick which had VMware loaded. But I would imagine this would work. Maybe someone else can confirm. I bought one 9240-8i and flashed it into 9211 IT mode which works well,except for missing storage information on iLo. Thanks for leaving the comment. Does the lack of info in iLO cause much pain? I’m considering your very setup, really don’t want to spend P410 money. Also were you able to flash the m1015 to IT mode in the Gen 8? Was you successful in passing through the card in ESXI to a guest vm? Are you sure the Microserver supports up to 3 TB..? Hi, Aleks. I wrote 3TB based on HP’s specs. If some people are running larger drives they’re doing so at their own risk… it’s probably okay but I like to stay on the safe side (sometimes). I used a Supermicro board. ahh – ok. i only have the Gen8. Any suggestions?